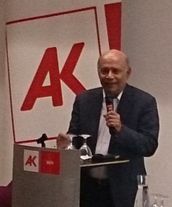 Professor Amit Bhaduri, Professor Emeritus at the Jawaharlal Nehru University, discussed the fatality of ignoring power relations in mainstream economics at the first Kazimierz Łaski lecture. Kazimierz Łaski was born in Poland in 1921. He graduated in economics in 1954, intellectually shaped by his mentor Michał Kalecki. In 1968 Łaski lost his professorship during a new wave of antisemitism, was forced to leave Poland and lived in Austria since then. With the help of Josef Steindl and Franz Nemschak, he obtained a job at the Austrian Institute of Economic Research (WIFO) in the Department of Comparative Economic Studies, which should later become the wiiw, where he was not only economist, but from 1991 to 1996 took over the position of the scientific director. Until his death, on 20th October 2015, he participated in the work of the institute as senior research associate. In addition, he was Professor of Economics at the Johannes Kepler University Linz for 20 years. He worked intensively on transition economies and critically assessed the shock therapy in the 1990s, as well as austerity measures after the outbreak of the latest economic crisis. Kazimierz Łaski was intellectually rooted in Poland, with his teacher being Michał Kalecki, for whom mass unemployment was driven by a lack of demand, so the substance of his theory was demand management. The theory of Kalecki developed simultaneously to Keynes’ General Theory of Employment, Interest and Money, and, according to Bhaduri, was possibly even more precise. The General Theory was published in 1936, after England had been forced to leave the gold standard in 1931 and the city of London lost its power. This is the historical context that allowed the Keynesian theory to be listened to. 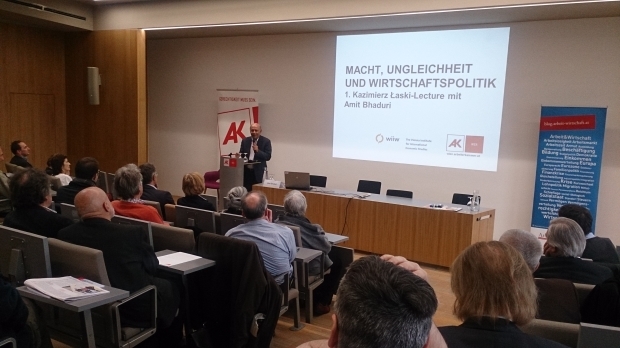 Amit Bhaduri referred to Kazimierz Łaski and Josef Steindl as very different characters, with one thing in common: the way in which they looked at economic power and how it expresses itself in economic policy. The neglect of power is the main reason for Amit Bhaduri to criticise mainstream economics. The best analogy for economic power is the law of gravity: it is not directly observable, but its effects are very directly observable. In the case of economic power, it is manifested in economic policy and inequality. Yet, you cannot observe economic power using methodological individualism. Therefore, Bhaduri denunciates works such as Becker’s 1957 book The Economics of Discrimination, which is a competitive model where race relations are a matter of taste and individuals maximise their utilities by their behaviour including discrimination. But the role of institutions – in this case working through e.g. real estate management – is neglected. Similarly, the general equilibrium theory assumes that all individuals are connected via the market resulting in quantities and prices for given budgets, but power does not feed into the model. Nobody has the power to set prices. Everybody is a price taker. You need to invent an auctioneer to match supply and demand. This is where “minor dissidents” – as Amit Bhaduri called them – come in, enriching the theory by arguing that price setting is an outcome of incomplete information. This group of economists include among others Joseph Stiglitz, George Akerlof, and Oliver Hart. However, equally important as information seems to be the power of misinformation. Amit Bhaduri referred in this respect to false claims by bankers and paid advertisement by politicians. Therefore, power is not only about having more information, but also about making use of misinformation. Yet, he considers power expressed as being able to set prices or to use (mis)information for persuasion as too feeble. The doctrine for many developing and emerging economies is: We must grow! Policy makers often ignore issues of distribution, development, health, education – they are focused on growth, independently of what the content of growth is. And as the governments do not have the necessary funds for investment, it should be corporations that lead growth. The policy that India is following is to give natural resources – often land – more or less for free to corporations (China and some Latin American countries follow similar strategies). These corporations become wealthy – comparable with the rise of Russian USD-billionaires through privatisation after the break down of the Soviet Union. The outcome is that India – one of the poorest countries in the world – is ranked fourth in producing USD-billionaires. Some of the earnings of the corporations are in turn given to political parties in order for these policies to continue. And in the democratic system of India, parties fight over this money. The ultimate result is that corporate-led growth turns into a corporate-led democracy. Corporations learn that it becomes easier to get rich through lobbying and not investing; easier to profit from natural resources that from industrialisation. Many examples of power relations, such as the Indian example above, cannot yet be embedded in models; but just because there are not the right models out there yet, we should not stick to models that do not fit – such as general equilibrium models. The research field of economics is also strongly affected by power relations. The real problem of economics is not that we are asking the wrong questions and are lacking proper instruments. The problem is that, through power relations, others are asking the questions for us and dictate which instruments/models to use. Amit Bhaduri is Professor Emeritus at the Jawaharlal Nehru University, Delhi, and is currently the Visiting Chair Professor in Political Economy at Goa University. His research fields include growth theory, Keynesian and Post-Keynesian macroeconomics and development economics. His contribution as an economic theorist lies in challenging the mainstream theory and analysing the role of power in the market economy. Together with Diane Elson he is 2016 Leontief Prize Winner, awarded by the Global Development and Environment Institute at Tufts University. The event was jointly organised by the Vienna Institute for International Economic Studies (wiiw) and the Vienna Chamber of Labour (Arbeiterkammer Wien).